Good evening from Allen Fieldhouse. No. 2 KU set to take on Louisiana in 15 minutes. The band is playing Backstreet boys right now. KU's starting 5: Dotson, Grimes, Vick, D. Lawson and Azubuike. What makes a Cajun Ragin? Did Dedric Lawson just shoot while sitting down in the paint? Prob smart move by Louisiana to foul Vick on a 3. Dotson looks ridiculously comfortable out there already... In total control, playing fast and, most importantly, having a friggin blast. The sky's the limit for this kid. #KUbball leads 13-6, 16:21 1st half. He guys - @CoachBradford21 is here. Every fan that asks to see his socks gets an autograph! Snake-bitten... Dedric with a strong move and tough finish and it did everything but go down. #KUbball leads 15-12. Grimes just testing the wind. A little breeze in here. Coach calls timeout to see if the fellas prefer ham or turkey next week. Sherron is not happy with that foul call. Also - Sherron would have 25 already. Self not happy with his team right now... Sloppy after a fast start. Grimes and Dotson checking back in. Dedric Lawson looks like he's a little in his own head. 19-18, Louisiana, 11:38 1st half. Looks like some guys started their weekend a little early. Louisiana has hit three of its first six 3-pointers. At @Ballin25Braun is in the house. Looks like big Mike is with him. 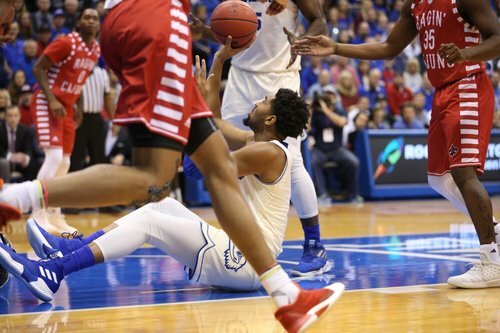 Dedric Lawson is down on himself... Before that foul even, he rolled his eyes and hung his head over that errant pass on the last possession. He sits. Lightfoot's in. #KUbball trails 25-20, 10:15 1st half. Both Dedric Lawson and Udoka Azubuike on the bench with 2 fouls. Who scores for KU in the final 10:00 of 1st half? #KUbball down 27-20 vs Louisiana.